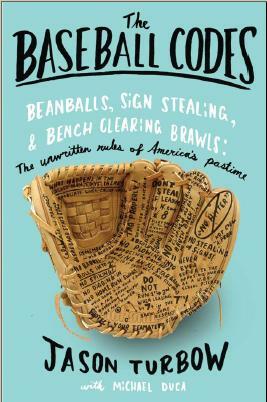 The Baseball Codes — colloquially referred to as the unwritten rules of the game — comprise the methods players use to police themselves and each other. It’s a moral code that, on and off the field, is used to keep the game pure. By Jason Turbow with Michael Duca; Random House, March 2010. Thanks again for the fine work! Read it and loved every second of it. Great work!! Can you change your position in the same batting opportunity? … For example, you started right handed and after a few pitches, you decide to go lefty? … Is that Ok? I’d say that’s more of a strategic situation. Switching hands mid-at-bat doesn’t have much to do with respect. Then again, I’ve never heard of it happening, so who knows how a pitcher would react . . .
Tangential, but still worth relating: I read an article in the NY Times a few years ago about a switch-pitching college player. He used a customized glove that worked with either hand, and he’d change from righty to south-paw according to the batter. One day, a switch-hitter came to the plate and set up to bat lefty. When the pitcher switched his glove hand so that he could throw lefty, the batter moved to the other side of the plate to bat righty. When the pitcher then switched so that he could throw righty, the batter again moved over to bat lefty. This went on for several minutes until the umpire finally consulted the rule book and determined that the pitcher has to choose which arm to throw with first and then stick with it for the entire at bat. Too bad there aren’t more switch-pitchers out there. It’d be interesting to see what unwritten rules would ensue. Cliff beat me to it. Should have read all the posts before commenting. Kudos. You guys both rock for chiming in on this. Thanks for the collective heads-up. Bought and read the book and really enjoyed it. The only thing I was left wondering was whether the use of drugs like hGh that can’t be detected by testing is considered by the players as a whole to be a violation of the Code or trying to gain an advantage (as in sign-stealing). My viewpoint on PEDs is no different than my viewpoint on amphetamines (otherwise known as “greenies”), which were abundant in big-league clubhouses through the ’60s, ’70s and beyond. They’re things that players would never have considered had they been in a different line of work, but over time they became accepted within the culture as an acceptable means toward gaining a competitive edge. I hardly condone the use of PEDs, but it’s an institutional failure, not an individual one. As you suggested, the guys who used them were just falling into line with accepted practice. I have yet to hear a story in which a player was scorned within his own clubhouse for using them; that makes it acceptable within the context of the Code. The reason we didn’t touch the subject was that it’s simply too complex to do it justice within the context of a single chapter. Also, while we were researching the book, another book — Game of Shadows — came out, offering the type of complex, nuanced look at the subject that we couldn’t hope to touch in the five or so pages we’d have to address it. I am a casual baseball fan but when I heard your interview on NPR a couple of weeks ago I was very intrigued. I loved your book. I never knew how complex the game was beyond the surface level. When I went to an Angel game after finishing the book it was a totally different experience from past games. I would love to read the other 75% of the book that was cut. Kudos to you and Michael! I’m looking forward to tomorrow’s article about the Marlins and the Nationals game tonight. One has to expect that the Marlins will send a message to Nyjer Morgan. Reading the post game comments from the players, one gets the sense that were Morgan’s efforts in a vacuum that there would be no problem with his running over C Brett Hayes, but given Morgan’s recent play against St. Louis, they didn’t take too kindly. For the record, replays seem to show, and Marlins manager Edwin Rodriguez believes, that had Morgan slid he would have been safe. Marlins righty Chris Volstad will be on the hill versus former Marlin Scott Olsen. It’ll be interesting to see what happens. Given Olsen’s somewhat checkered history in Miami we may see some fireworks from both sides. This is the season’s final meeting between the two teams, and with neither headed to post season the anticipated retaliation is the lone point of interest to casual fans. Agreed, Curt. I’m generally willing to give plays like that a pass — it’s good, hard baseball, and even though it did look like Morgan would have been safe had he slid, it was a split-second decision and cleanly executed. In light of his prior indiscretion (not to mention getting into another verbal altercation with a fan), it wouldn’t be shocking to see the Marlins retaliate. This will be especially in light of the fact that Brett Hayes is expected to miss more than a week. Really enjoying reading this book so far…any chance it is printed in a large type edition? I bought it for my father to read, but his eyesight is bad so he had to give it back to me becuase the print was too small to read…he is a baseball fanatic and I would love for him to read this book…..
Just heard from Random House that no, if nothing is forthcoming on Amazon or Kindle, nothing exists. Looks like you’ll just have to read the entire thing to him, one page at a time. Enjoyed the book very much. It prompted this comparison between some of baseball’s codes and cricket’s.